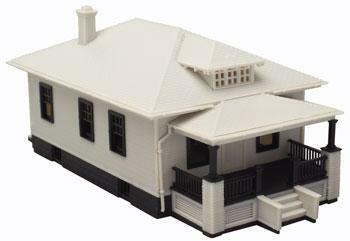 This is the N Scale Barb's Bungalow Home Plastic Assembly Kit from Atlas Model Railroad Co. Suitable for Ages 14 & Older. Retail $29.95 SAVE 24% ! have not started this build yet, but after looking it over it is nicely detailed and part&apos;s are crisp and clean. no flash to mention and clear instruction&apos;s. this kit will look great in any town scene no matter the era. there are still house&apos;s just like this in my town. atlas has always been known for good quality and value. this kit is no exception.i ordered the kate&apos;s colonial home kit at the same time. they will be the start to the older section of my layout neighborhood. give the town a bit of history. Modeled after a popular catalog home of the 1920s. Rain gutter and downspout detail.